So I was sick in bed and Sam comes running into the bedroom saying that I’ve got to look at these dead plants and the water droplets. I hesitated for a minutes saying I was tired, but put on shoes and jacket, grabbed the camera, and went outside in my pajamas. Luckily, it was on the back porch. 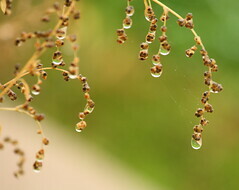 Aren’t these droplets lovely? The spider web adds a nice touch.